President Donald Trump greeted Germany’s Angela Merkel with a handshake at the White House Friday — a cordial start to difficult talks between long-time allies who now differ on a host of issues from immigration to NATO. The veteran chancellor arrived at a snowy White House, hoping to reverse a chill in relations after Trump’s tough election rhetoric. The two leaders shook hands and smiled for the cameras before entering the West Wing, for a meeting that had been delayed three days because of bad weather. 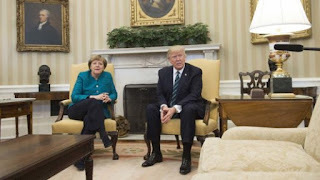 The unlikely pair — a cautious German chancellor and impulsive US president — moved to the Oval Office, hoping to narrow differences on immigration and NATO but also Russia and global trade. For years, Merkel — a trained physicist — had been president Barack Obama’s closest international partner, with the two sharing a strong rapport and a similar deliberative approach. He also demanded that countries like Germany step up defense spending, a sensitive issue for a nation that has had a strong pacifist tradition since World War II and proselytizes fiscal prudence. In a similar vein, Merkel has sought to remind — some in the White House would say lecture — the real estate mogul about democratic values. Comments like that have prompted some of Trump’s fiercest critics to declare Merkel the new “leader of the free world” — a moniker normally taken up by the occupant of the White House. Between meetings, the pair will hold a joint press conference at 1:20 pm (1720 GMT) that is sure to dredge up past barbed disagreements. “Germany looks toward Washington with a mixture of vulnerability and confidence,” said Jeffrey Rathke of the Center for Strategic and International Studies. “Germany is the de facto leader of the European Union, but the Union is undergoing internal and external trials that make its future uncertain,” he added. “And Germany has placed all of its security eggs in multilateral baskets.” Since coming to office, Trump has tempered his comments slightly, but is still likely to press for higher defense spending. And European officials still fret that Trump has too closely embraced the nationalist ideology of key advisor Steve Bannon. Bannon has championed trade protectionism and opposed the European Union and other multilateral institutions that underpin the world order. Merkel is sure to raise the issue of a proposed US border tariff that would hit German manufacturers hard. To underscore the point, she has brought a host of German business leaders along for the trip. Before departing for the United States, Merkel also noted she was going to Washington as an envoy not just of Germany, but of Europe too. “I will of course point out that for us, our country and our membership in the European Union are two sides of the same coin,” Merkel said. Hours before the pair met, Germany’s Economy Minister Brigitte Zypries warned that Berlin could take Washington to an international trade court if it insists on imposing punitive tariffs on German goods. Amid the heightened rhetoric, she acknowledged that “a lot is at stake” for the White House talks, calling for clarity and “creating a reliable base” for relations to reduce the “poisonous” uncertainty clouding the economic outlook. In a conciliatory tone, a White House official said that Trump will seek out Merkel’s views on Russia. That is a nod to her years on the international stage and experience growing up in communist East Germany, where she learned Russian. “The president will be very interested in hearing the chancellor’s views on her experience in interacting with Putin,” said the official, speaking on condition of anonymity. “Of course she has been doing this for more than a decade,” the official said. “He’s going to be very interested in hearing her insights on what it’s like to deal with the Russians.” Trump’s own background may also help break the ice. His family hails from Kallstadt, a tidy village nestled in southwest Germany’s lush wine country. His grandparents left for America more than a century ago fleeing poverty and later, after a brief return, trouble with the law.